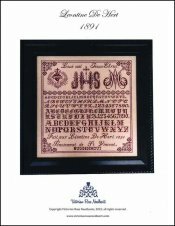 Leontine De Hert 1891 [H7005] - $24.00 : Yarn Tree, Your wholesale source for cross stitch supplies. Cross stitch pattern by Victorian Rose Needlearts. Leontine De Hert stitched her sample in the year 1891 while a student of St. Vincent boarding school in Buggenhout, Belgium. The sacred heart with a crown of thorns & cross indicate Jesus' sacrificial love for humanity. The Christogram IHS (Jesus Hominum Salvator) is translated: Jesus, the Savior of Mankind. The intertwined AM is known as the Auspice Maria or the Ave Maria, which is venerational symbol for the blessed protection of the Virgin Mary. Stitch count 243w x 253h.